India: What is it like to live in a chawl? 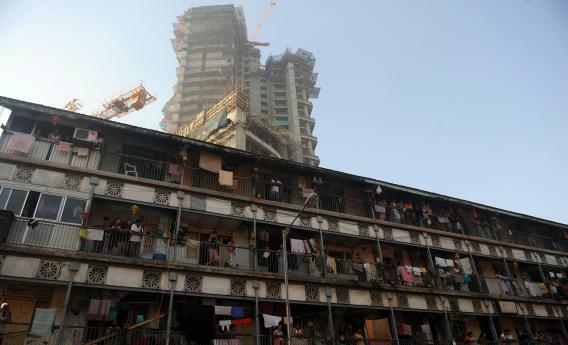 Residents of a chawl, traditional old tenement for the working class, stand on their common balcony as a new under-construction high-rise building is seen in the background in central Mumbai on March 1, 2012. Years ago, I was at a party in New Delhi where I was speaking to a very well-to-do socialite who originally hailed from Mumbai. The conversation had been pleasant up to that point, and I mentioned that I originally came from Mumbai as well. She asked me where and I told her. Her eyes widened with shock and she stared at me with an open mouth before stammering for a response. I contemplated for a long time whether I would answer this question. I know all too well how people’s perceptions change in the face of this kind of information. But in any case, here it is. Get ready for a long one. There are all kinds of chawls in Mumbai, and while I have visited some that at the time seemed nice(r) to me (kind of like the one shown in the movie Katha), I happened to grow up in a particularly dilapidated one. Our “kholi” was on the ground floor, the corner-most one in a row of 10. After that, it was divided by a makeshift gutter, and a new row of 10 started. Each ‘kholi was approximately 10 x 30, divided into a common front room, kitchen, and bedroom. We had five adults and three children in our kholi, but during my stay there, it had sometimes gone up to seven or more adults and two additional children. This was not uncommon, and many families rented out their front rooms, so it was nothing unusual for each kholi to be occupied by 10 to 15 people. Life in a chawl is never dull. People live an open door life and you get to know the ins and outs of each family. There is a lot of stimulus for children, good and bad. Mostly though, it’s not a desirable life, and I thank my lucky stars often that my mother had the foresight and determination to claw her way out. Living Conditions: Atrocious. Chawls are never in great condition anyway, but this particular one was the one of the oldest in Mumbai. All our walls and ceilings were crumbling badly and supported by rotting wood beams that, in turn, were crumbling more. We were surrounded by huge open gutters on two sides and the musty dampness permeated the walls, the floors, the furniture, the curtains … The floors were cracked open—partially due to bad construction, partially due to the water content—and roaches, centipedes, earthworms, and even the occasional scorpion were no strangers to the home. This was particularly cruel given that actual running, clean water was nowhere to be found. Water was rationed (as is often the case in Mumbai) and came on for an hour (or two) twice a day. This was the time when we filled our corrugated iron drums to be used throughout the day for cooking and washing. The problem was that the dampness had so infiltrated and cracked the pipes which passed through the neighboring gutters, that the water often came with chunks of human and animal excrement mixed in. We drank it anyway. (I was recently hanging out with my crowd of wealthy friends from Mumbai, when a conversation about social conditions gave way to one of them remarking that clean water is not a problem in India, since you can always buy a bottle of it. I couldn’t even bring myself to argue.) Other than that, I remember craving, CRAVING(!) sunlight, greenery, and some kind of contact with animals. It was so overrun by people that every other form of life had been stamped out. There was no grass, flowers, or plants to be found. The only animals that were around were wary of the cruelty people could inflict. Toilets: The common latrines, three for 10 kholis, were all the way at the far corner of the building. They made the bathroom in Trainspotting look clean. I never saw them get cleaned, ever. Every surface of the latrines was covered in filth, they were often missing lights, and my mother made it a point of going at 4 a.m. to avoid the hassles of lining up with a bunch of strangers in the morning. She said that even at that time, there were often drunkards and lechers hanging out there, and you can imagine what it must feel like to women to have to share this. General life: So colorful! Kholis are so small that people would suffocate if they actually closed their doors and shut themselves in. All the doors were open at all times except bedtime. (The only exception to this was when gang wars, riots, and rumbles broke out. Apparently, poor disgruntled youths are the perfect people to bait with a little money and a lot of propaganda, and even as young children, we knew to rush into the house at the first sighting of a rushing mob and watch through the cracks in the closed windows till the violence and bloodshed died out, often literally). There were all sorts of people around ranging from the professional (our elderly neighbor who we called Bha was a lawyer) to the outright criminal who engaged in everything from gambling, match fixing, drugs, prostitution, and other organized crime. All of these activities happened around us, and as children who played outside and ran through the kholis all day long, we were often cautioned by other kids to avoid “certain kholis” or certain blocks altogether. People tried to be fun and warm, and it wasn’t unusual for people to share whatever meager things they had. So when my sister didn’t like the dinner at our place, she would run away to our neighbors’, and they would feed her some delicious Marathi food. Whoever had a working TV could expect a crowd to come over in the evenings when the Doordarshan shows started. If you didn’t fit in the room, you stood at the door or the window to peep in. If there was an event in the neighborhood, someone would surely let you know so you could come along. We made sure we went into every home for Ganapati Pooja and a free modak. People lent a hand in other ways too. Schools ask for a father’s signature to register children, and whether it was these official visits or running errands, a gentleman we called Shirish Chacha accompanied my mother to help out, in the absence of my father. Everybody shared everything they could. Everybody helped others if they could. The despair and the desperation: The sense of rot was palpable in our everyday lives. The poverty had so permeated our lives that we took every kind of neglect, every kind of injustice, every kind of horror with a pinch of salt. So when we slept and roaches crawled on our faces, it was a part of life and we were thankful it wasn’t rats. When we developed some kind of infection that left lumps of rotting flesh on our lower parts, nobody seemed too worried. We ran through the streets unbathed, without shoes, and teeming with lice, and no one cared. No one cared that we had tapeworms and occasional bouts of amoebic dysentery. Our young neighbor Sudha, who originally only had polio (but eventually went half mad with neglect), would drag herself around the neighborhood, trailing menstrual blood behind her sometimes, and her family didn’t try to help her. When our friend’s drunken father threw down his drunken mother with a sickle at her throat, no one intervened. The children actually giggled. Our upstairs neighbor (who was probably a schizophrenic) would occasionally have bouts when he would violently chase the children, and it was our responsibility to get in a house and shut the door on time. Another upstairs neighbor hung himself, another was attacked and stabbed, another was beaten to death with hockey bats … People treated these as passing incidents. The worst I heard was about a woman’s baby. The chawl was infested with rats the size of cats. They were so big that if we were running in the stairwell and one happened to come on the stairs, we would have to stop our game and wait. We couldn’t skip over them because they would take up the whole stair and we didn’t dare confront them. One day we heard that a woman (who was a maid) had left her baby at home and gone to work. In her absence, rats killed and ate her baby. I. Cant. Imagine. The. Horror. Years after I came to America, I heard the news that Shirish Chacha had disappeared. It may have been an accident, or an issue he had with somebody, but he never came home one day. His family didn’t bother looking for him beyond the preliminary obligations. This was a man who came and spent time with us, played with us, paid attention to us when other adults disregarded us. He was bright and could always make us laugh. He took us to all our doctor’s visits. He was our ‘father’ for our school visits. This is a man I loved deeply. And he disappeared without a trace. He disappeared without having his last rites. That’s life in the cradle of poverty. No one waits. Years after we moved to America, my sister went to visit the chawl where we grew up. She said that it had gotten a lot more crowded, but the conditions had not improved. Her best friend had gotten married and worked as a clerk in a bank. There were minor improvements in the lives but by and large people were still the same way and the cycle was continuing. The sad part is this is considered middle class living in India. We had a roof over our head, we were relatively safe, and we went to school. This passes for middle class. I can only imagine what a ‘poor’ person must feel like. There are parts of the chawl I can’t shake off to this day. I am absolutely disgusted by roaches and fanatic about scrubbing my house for fear that one may find its way into my apartment one day. I am obsessed with running water. To this day, I find myself standing in my shower, with its marble tiles and jacuzzi tub and marveling that I don’t share this with anyone. It’s my bathroom, and when I turn on a tap, water comes out, and if I want I can stick my face in it and drink it! And I can stay in it as long as I want—I don’t have to share it with anyone!! I walk around secretly delighted that I can run my hands along the walls, and they are uncracked and dry! And I have a dog. I have a dog!! All said and done, a chawl education is unlike any other education. You get to see how far the pendulum swings for people’s kindness and cruelty that everything seems watered down for the rest of wherever you go. That life seeps into your pores and runs through your veins. I’m never ungrateful that I live a blessed life. No matter where I go, I am a part of that world. I’ve worked in fashion for most of my adult life in NYC, and through various turns of events come to know people who’ve never seen any unfortunate conditions. A lot of them are wonderful people and my friends, but they live a different life. I can wear a designer outfit and fake it with the best of them. But I carry the chawl around wherever I go. It ticks away at my mind. I am not this person. I grew up in a chawl. What should everyone know about India? Do arranged marriages in India really work? Isn’t it scary to marry someone you don’t even know? What are some mind-blowing facts about Hinduism?